A physically active lifestyle may extend your life and reduce your risk of developing heart disease, stroke, type 2 diabetes, depression and some cancers. In addition to improving health, physical exercise helps you lose unsightly and unhealthy belly fat. To receive some benefits, work up to a minimum of 150 minutes per week of moderate-intensity cardio exercise. For significant changes, you'll need to exercise even more than this minimum recommendation and increase your intensity at some workouts. The minimal 150 minutes per week of moderate-intensity cardiovascular exercise or 75 minutes of high-intensity cardiovascular exercise advised by the CDC can help you maintain your weight and even lose a modest amount. Moderate-intensity activity is equal to brisk walking, dancing, water aerobics or gentle cycling. A combination of moderate- and high-intensity activity is also acceptable. High-intensity exercise involves jogging, biking faster than 10 mph or swimming laps. Break the activity up into 10-minute increments, so it's less overwhelming, if your schedule requires. This minimal amount can also help you stave off the accumulation of belly fat. But, you might need up to 60 minutes per day to lose it. 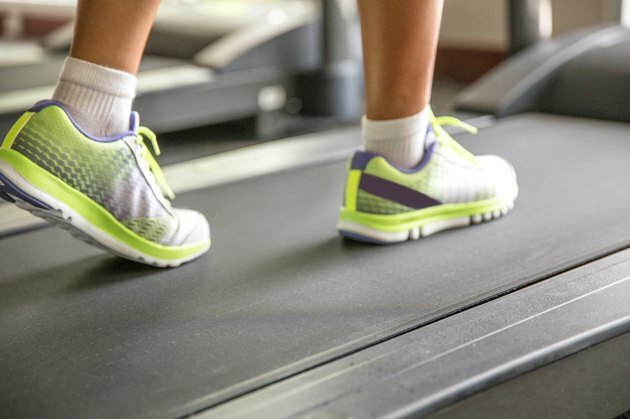 The American College of Sports Medicine advises at least 250 minutes per week of moderate-intensity cardio to experience clinically significant weight loss. That's about 50 minutes per day, five days a week. Performing some of your cardiovascular exercise at an extremely high intensity improves belly fat loss. A study published in Medicine and Science in Sports and Exercise in 2009 showed that when obese middle-aged women made three of their five weekly exercise sessions occur at a high intensity, defined as greater than their lactate threshold -- an extremely high-intensity at which muscle fatigue starts to set in -- they significantly reduced their total abdominal fat after 16 weeks. They lost more belly fat than women in the study who burned the same number of calories doing only lower intensity exercise five times each week. The high-intensity sessions took less time to complete and had a more positive impact. However, high-intensity workouts aren't for everyone. Consult your doctor or a personal trainer for an assessment to make sure they're safe for you. High-intensity interval training, or HIIT, might be just as effective as one continuous high-intensity session. With HIIT, you alternate bouts of all-out intensity -- defined as about 90 percent of maximum effort -- with periods of low-intensity exercise or rest. A paper published in a 2011 issue of the Journal of Obesity found that sprint and recovery periods lasting from 6 seconds to 4 minutes are effective in stimulating fat loss. The amount of total exercise time required to get results from HIIT varies. Studies show fat loss benefits accrued from 60 minutes of alternating 4 minutes of hard work with 2 minutes of recovery to short sessions that involve 60 eight-second sprints followed by 12-second recoveries performed for 20 minutes total. Do these all-out sessions on a stationary bike, a treadmill or with calisthenic exercises such as burpees and split jumps. One of the major benefits of HIIT and high-intensity training is the less time needed to gain results. But, because of the demanding nature, you only need to perform these type of sessions two to three times per week. On other days, still do a moderate-intensity session to burn more calories and get better results. Consult a personal trainer for help introducing HIIT into your exercise routine safely. Devoting all your exercise time to cardio when you're trying to lose belly fat is a mistake. Strength training offsets muscle loss, which often occurs when you put your body in a calorie deficit. The American College of Sports Medicine says that strength training as part of a fat loss regimen further reduces health risks and increases fat-free mass. Perform at least one set of eight to 12 repetitions of a resistance exercise for each of the major muscle groups twice per week, as recommended by the CDC. This will add an additional 20 minutes or so on two days of the week. Seek out ways to be active outside of structured physical activity to also help with belly-fat loss. Adopt an active hobby, such as hiking, and fidget when you do sit. Gesture, tap your foot and twirl your pen. Take advantage of stairs, large parking lots and chores to add more activity and a greater calorie burn. If I Exercise Twice a Day Will I Lose Weight?